Well what a week it's been for fans of brand new, high-end laptops from the biggest names in the business - both Apple and Microsoft have held major events in the last few days, showing off their latest and greatest wares, and particularly new premium laptop models. If your head's spinning from an overload of internal spec sheets and marketing speak, take a few deep breaths, fix yourself a drink and read on for our head-to-head guide. We pit the 2016 MacBook Pro against the 2016 Surface Book to see which one comes out on top. First up, how do these laptops look? Perhaps more important a factor than you might realise, but also one that we can't give you much help with - laptop beauty is in the eye of the beholder, after all. For what it's worth we're very much taken with the design of both these high-end laptops though the classic MacBook look probably just shades it. The new i7 Surface Book has actually changed very little from the original - you get a 13.5-inch screen and a laptop that's 22.8mm thick when closed. The 2016 MacBook Pros come in a variety of configurations of course, but they're all thinner than Microsoft's laptop: you can pick from a 13.3-inch or 15.4-inch display and the thickness varies from 14.9mm to 15.5mm. That's primarily due to the hinge on Microsoft's Surface Book, of which more later. Apple's laptops have a native display resolution of 2,880 x 1,800 pixels (220 ppi) on the 15.4-inch models and 2,560 x 1,600 pixels (227 ppi) on the 13.3-inch machines. That compares with a 13.5-inch, 3,000 x 2,000 pixel (267 ppi) display on the i7 Surface Book. Microsoft's laptop has more ports, including an SD card reader and Mini DIsplayPort. Apple's MacBook Pro's settle for four USB-C/Thunderbolt 3 ports (and a headphone jack), so anything else you want (like a memory card reader) will need an adapter. There's also a big OS choice to make here too by the way: macOS Sierra or Windows 10. We've been digging deep into the specs of these laptops so you don't have to, and there are a lot of specs to get through. Apple's three new MacBook Pro models are the 13.3-inch without the OLED Touch Bar, the 13.3-inch with the OLED Touch Bar, and the 15.4-inch with the OLED Touch Bar. The larger model also gives you the option of slightly more powerful innards when you configure your machine. Across all three models, you can pick from 8GB to 16GB of RAM, from a 2.0GHz dual-core Intel Core i5 to a 2.9GHz quad-core Intel Core i7 CPU, and from 256GB to 2TB of solid-state drive space. Life is slightly easier when configuring a new Surface Book: 8GB or 16GB of RAM, from 256GB to 1TB of storage space, and your choice of three Intel i7 CPUs - Microsoft hasn't specified the exact models but they're from the same Skylake series as the ones being used in the MacBook Pros. So which is better for performance junkies? It's probably too close to call, at least on paper - remember the speed of a laptop isn't just about raw specs but also about internal optimisations and software efficiency. The i7 Surface Book is an absolute powerhouse and the 2016 MacBook Pro can be configured to be one too. Graphics performance is one of the key upgrades for this year's Surface Book, with Microsoft promising double the GPU performance of the previous model at the highest configurations (with an Nvidia GTX 965M graphics card inside). As for battery life, the manufacturers tell us the MacBook Pro can last up to 10 hours and the Surface Book up to 16 hours playing a video on a loop, but we'll really need to get our hands on them to decide if this is a fair assessment. If those figures turn out to be accurate it's one reason to go with Microsoft. Surprisingly for two laptops, there's a lot to talk about when it comes to extra features. Well, two features in particular. The big update on the MacBook Pros is the introduction of an OLED Touch Bar above the keyboard, which you get on every model apart from the entry-level 13.3-inch one. It brings up context-sensitive shortcuts, so music player controls when you're listening to something in iTunes, and a quick scroll button when you're viewing a lot of photos, for example. Apple wants developers to use the Touch Bar to intelligently bring up key functions that users are going to need, though it might take a while before a good number of applications to get updated. All of Apple's apps will be first in line for an upgrade of course so you should have plenty of ways to play around with the Touch Bar right from the off. The Touch Bar also lets you use Touch ID on a Mac for the first time, meaning a quicker sign-in process and instant Apple Pay payments and the like. The Surface Book doesn't have a Touch Bar but it does have that fulcrum hinge and a removable display, so you can use part of the laptop as a tablet, or use the keyboard as a stand with the screen facing in the opposite direction. There's touchscreen functionality too, something the MacBooks don't have, and support for the Surface Pen if you want to doodle on the display or do anything else that's suitable for an over-sized stylus. Depending on how you want to use your laptop, these two key features - the Touch Bar on one side and the detachable display on the other - may well be more important in helping you choose between these two devices than the actual specs or design. There's no doubt about it, these are two exceptionally powerful (and good-looking) laptop line-ups, and you're unlikely to be disappointed with either - though you might want to wait for our full reviews of the new kit before parting with your cash. Your choice is easier with the new Surface Book, because there are fewer configuration options to pick from. Apple offers a broader range of specs in its new MacBook configurations, plus two screen sizes, so there's more opportunity for you to tailor the machine to suit your needs - you can save some cash if you don't need the most powerful components or the maximum amount of internal drive space, for example. That said, we've focused on the new, more powerful, i7-equipped Surface Book in this article (the "Performance Base" model). The cheaper, less powerful, original laptop is still on sale, so that's worth bearing in mind. 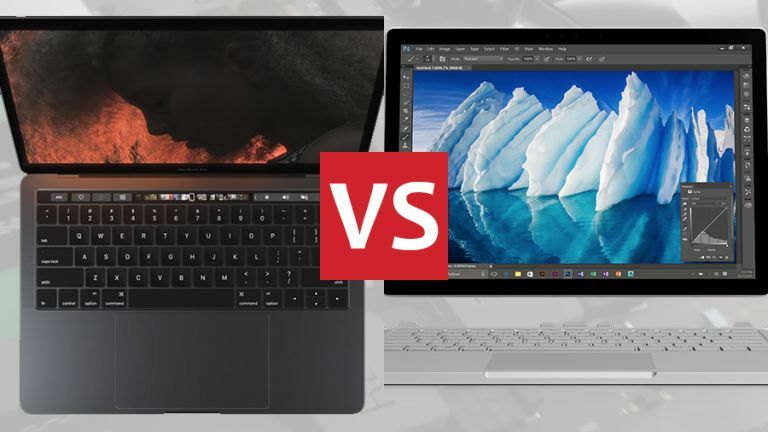 For a direct head-to-head comparison between the brand new, top-end MacBook Pros and the brand new, top-end Surface Book it's a very close call indeed. The difference really comes down to whether you prefer macOS or Windows, whether you want that tablet and touchscreen functionality, and how much you have to spend - the laptops are pretty much neck-and-neck on everything else, or at least close enough for it not to make too much of a difference. Prices start at £1,799/US$2,399/AU$3,799 for the i7 Performance Base version of the Surface Book and go right up to £2,649/US$3,299/AU$5,199. As for the new MacBook Pros, you'll be spending between £1,449/US$1,499/AU$2,199 and £2,699/US$2,799/AU$4,249 before adding extras.